A regulatory reform announced in 2016 that could see Israel turn into a leading medical cannabis exporter ground to a halt last week after a difference in opinion split Israel's government into opposing factions. In August 2017, an Israeli parliamentary committee estimated that cannabis export could net Israel as much as $1.1 billion a year. Israel’s ministries of finance, agriculture, and justice are interested in cashing in on the potential revenues and fast-tracking the bill, while the ministries of public security and health oppose the reform. Last week, Israeli Prime Minister Benjamin Netanyahu sent the plan back to the planning board, ordering a reassessment of the economic potential of the reform. As the reform process seemed to gain traction, almost 400 Israeli farmers applied for cannabis growing permits. Some of them have already invested in building facilities required for cannabis farming. If the reform is not approved soon, these farmers are not expected to be able to harvest the crop in 2018. Some of these farmers have sunk hundreds of thousands of shekels and have shut down other operations hoping to join the fast-growing global business of medical marijuana, Meir Zur, head of Israel's farmers' organization, said in a statement. Mr. Zur noted that Israeli state officials encouraged farmers to hop on the cannabis bandwagon, now leaving them in a bind. On Wednesday, a group of farmers represented by Israeli attorney Hagit Weinstock appealed to the country’s Supreme Court in attempt to counter the current stalemate. Eight approved cannabis farms currently operate in Israel, supplying local consumers with medical cannabis. Israel currently permits the use of medically prescribed cannabis. 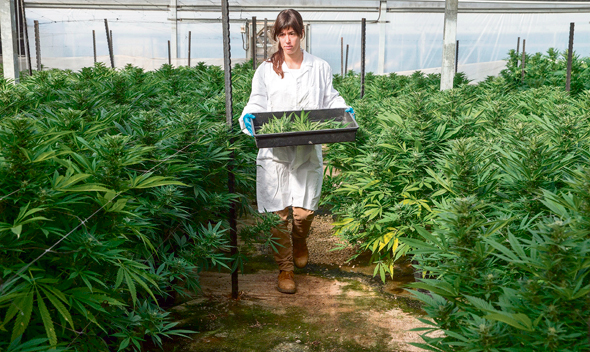 The eight farms can produce 25 tonnes of cannabis a year between them, while demand for medical cannabis in Israel does not exceed 10 tonnes, according to August’s committee report. The uptake: Israel could export as much as 15 tonnes of cannabis a year even without issuing additional permits. According to the report, U.K. is the current world leader in medical cannabis export, exporting just 1.8 tonnes of medical cannabis a year. In January 2017, research company Grand View Research Inc. estimated that the global medical cannabis market could reach $55.8 billion by 2025. "There is a unique window of opportunity available to Israel, to be among the first countries to allow research, farming, manufacturing, and export of medical cannabis," the authors of the Israeli parliamentary committee wrote in the report. Several interested entities have already approached Israel about the possibility of importing cannabis worth $400 million from the country, said officials at the Israeli Ministry of Finance speaking on conditions of anonymity. The Israeli Ministry of Public Security opposes the reform, claiming that medical cannabis farmed in Israel has already made its way to recreational users. Ministry officials have opposed the reform in government meetings claiming Israeli police does not have the required budget necessary to deploy security personnel that would make sure farmed marijuana does not make its way to the local black market, people familiar with the matter said. These officials demand that NIS 200 million ($56.5 million) be added to the annual budget of Israeli police for this purpose, these people said. The Israeli Ministry of Finance and Ministry of Public Security have arrived at an informal understanding that would see police budget increased by less than NIS 100 million, these people said. “To date, no charges have been filed regarding a leakage from medical cannabis farms to criminal entities,” Israeli Minister of Justice Ayelet Shaked said in a media briefing earlier this week.